Compliant Chemical Storage Locker - Strength, Security & Safety. When storing hazardous chemicals, compliance is essential. Different chemical groups require different types of storage methods, therefore safety accessories are key. It is important to understand the nature of each chemical, including its hazard classifications and risks, before storing. Fully customizable, compliant chemical storage locker by US Chemical Storage. Flammable and combustible chemicals must be stored in a building that meets NFPA 30 requirements. Other requirements may be necessary, depending on where the building is located and what storage applications are being used. Flammable storage lockers include structure types such as 2-hour fire-rated and 4-hour fire-rated constructions. 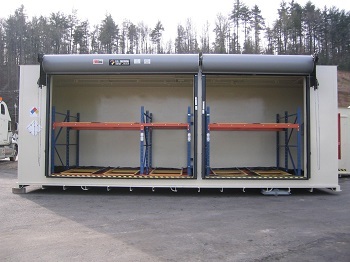 Non-fire rated buildings have different requirements for storing flammables. See below for variance allowances (check with local authorities for variance allowances before storing flammables). Compliant chemical storage lockers that offer a 2-hour fire-rated protection offer the ability to store chemicals 10-30 feet from occupied facilities or property lines. The 4-hour fire-rated construction allows chemicals to be stored 10 feet or less, or even inside facilities. Non-fire rated storage buildings allows you to store flammables 30 feet or more, away from occupied facilities or property lines. When dispensing category 1, 2, or 3 liquids inside your compliant chemical storage locker, ensure proper safety accessories are implemented. Accessories including explosion proof relief panels, explosion proof electrical equipment and fire-rated construction can be necessary. When customizing a chemical storage locker for dispensing, be sure to accommodate storage space with the amount of hazardous materials being stored. A secondary containment sump must contain at least 10% of the total stored liquid volume, or 100% of the largest container of stored liquid volume. In order to comply with the Environmental Protection Agency (EPA) Secondary Containment Requirements (40 CFR 264) the above statement must be met. Contact the EPA or local officials for specifics on sump containment regulations for your chemical storage application. There are a wide variety of options available from US Chemical Storage to meet many different chemical storage applications. Compliant chemical storage lockers by US Chemical Storage meet EPA, OSHA, NFPA, IFC, IBC regulations and FM or Warnock Hersey approvals. See below for a list of customized chemical storage applications. Learn more about chemical storage applications offered by US Chemical Storage. Our Strength is Your Security.